Hot off the electrons is an announcement from the Mayor-Elect, which the West Seattle blog has already commented on. The SLOG seems to be asleep at the wheel (or whatever implement they use to guide themselves). Four department directors have been retained in their current roles. Diane Sugimura will continue as Director of the Department of Planning and Development. Mark McDermott will continue as Director of the Department of Personnel. Stella Chao will continue as the Director of the Department of Neighborhoods. And Bill Schrier will continue as the Director of the Department of Information Technology. Additional department director decisions will be announced next week. Not clear what to read into it about the directors not named. Are they staying or going? Grace Crunican (Transportation) was widely suspected to be on the way out. The (fairly recently appointed) Parks Director Tim Gallagher is not mentioned. Anyone know any rumors? Planning and Development, Neighborhoods and Parks are obvious Departments which will affect Capitol Hill, as is Housing (and Transportation!). I’ve known Diane Sugimura since she was a DPD staff member helping us with the 1998 Central Area Plan. 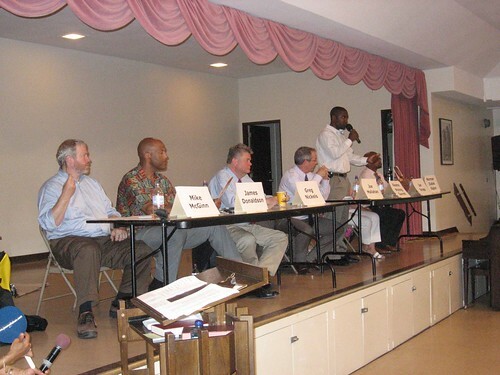 Mike McGinn and I served as neighborhood representatives on a DPD panel she chaired, a few years ago, discussing proposed multi-family housing code changes. I met Stella Chao soon after she was appointed to the Department of Neighborhoods. I’ve found both of them to be smart and approachable, and I think we should look forward to working with them as we continue to make Capitol Hill “more perfect“. Nice work Andrew – I feel a bit relieved, newbie mayor chaos will not be total. DRINK SUGGESTION for the cold – strong coffee, espresso great – and a dollop of Ameretto – hmmmmm – hot toddy? Justin – where is the how to make ’em – hot toddy post for the cold days? Needed badly. Adrienne Quinn of the Office of Housing and Alan Painter of the Department of Human Services – both effective and accessible leaders in a city that has a strong commitment to human services – ask the folks at Capitol Hill Housing about the excellent work the Office of Housing had done with the 2002 Housing Levy under Ms. Quinn and her able staff. It aint’t broke so don’t try to fix it!! Why was Diane Sugimura reappointed? Her arrogance is only eclipsed by the incompetence of her department.